This year I wanted to create a kid-friendly and colorful Easter table that is a little different than the usual pale pink color scheme. I headed to Target to check out their offerings this year and was very pleasantly surprised to find almost all that I needed to set a fantastic table! It all started with a $5 felt floral wreath that caught my eye. I initially thought I’d hang it in my dining room but as I started to plan, I decided to clip the felt flowers off the hanging ring and use them instead of fresh flowers on the table. And score…the result looked more like a higher end Etsy handmade find than the bargain that it was. The other two anchor decor items that offer excellent bang for the buck are the Magnolia Hearth & Hand jade cupcake stand for $5.99 (used as a candleholder) and $5 wire basket. These all topped a matching cute, easy care polka dot $12.99 tablecloth (note I used 2 for my dining table that seats 10-12). As a fun touch that brings our formal chandelier down to better suit the table, I added Target’s pom pom garlands and swagged them so that they were a bit uneven. The light is pretty large so to get the effect I wanted, I did need 3 garlands but fortunately, at $6 each, it wasn’t much to get the perfect look. My final Target touches were the cute $3 dotted blue paper straws and the $5 coral chargers. I didn’t want to use disposable plates, which is what Target offered to coordinate with this grouping, so I fired up the computer and found the colorful Easter plates at Pier One. I’ve had a special Easter glass ornament for many years that is made by Christopher Radko and instead of hanging him on my Easter tree like usual, I thought he added a bit of whimsy to the flowers. 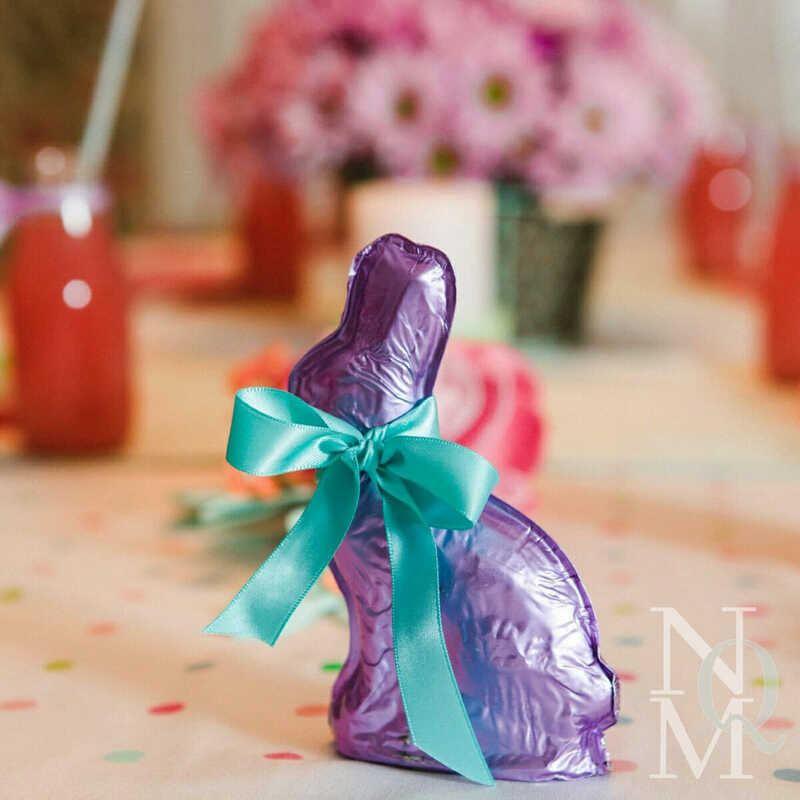 Final details include the lavender grocery store mums and daisies, green and white striped fabric as runners, two chocolate bunnies by Dylan’s Candy that sport spunky lavender foil wrappers, white eyelet trim napkins and Starbucks frappuccino bottles trimmed with little satin bows. Christopher Radko Easter ornament: discontinued but ebay has a few to choose from. Cotton eyelet trim napkins: No Qualms Mom collection; check thrift and antique stores for something similar.